If you have large numbers of staff to roll out data protection training to, then why not take a look at our data protection (GDPR) eLearning for managers? Takes around 30-40 minutes to complete, including end of module quiz. What a great way to raise knowledge about data protection around your organisation. Available to purchase on a per head basis. 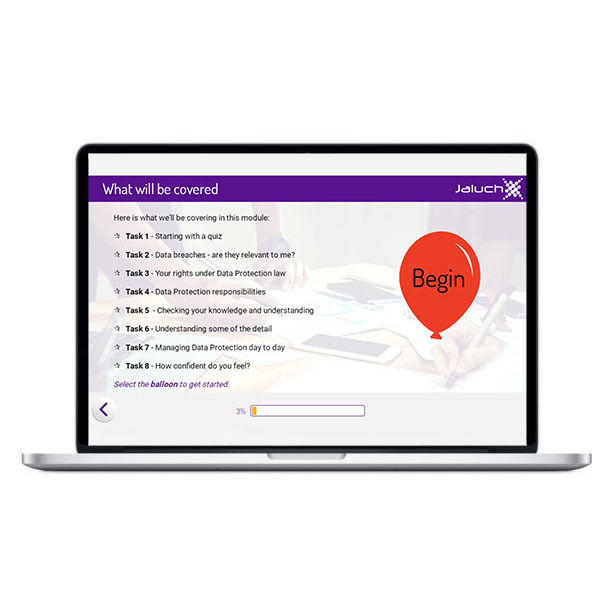 We are excited to offer an engaging and interactive GDPR eLearning course. We have two data protection courses available, one for managers and a lighter version for all employees. View the GDPR employee eLearning here. Data breaches – are they relevant to me? This manager’s Data Protection programme takes around 30-40 minutes to complete. Learners can start and stop the course as they please and their place will be saved. A certificate can be provided upon completion. Who should use this training? This course is designed for people who have some management responsibility. Some GDPR terminology can be hard to understand, we’ve stripped it back as far as possible to make the course ‘plain-english’ without changing or losing the meaning of the data protection law. The pricing quoted on this page is for an individual licence, which is valid for 4 weeks. If you need more than one licence then you can select multiples and the licences will be emailed out to you. If you need group licences (10+) please contact us for further details. Each aspect of the course can be tailored to produce a completely bespoke package, reflecting your own learning objectives. Customisations range from re-branding – logo replacement and re-colouring the template to match your company branding, to a full bespoke package where we can tailor the course to your organisation’s exact requirements by adding/removing certain topics, changing learning objectives, focusing on one specific area that you wish to address or incorporating links to your policies and procedures.This course can be hosted on our own LMS system, which gives users instant online access, which we can manage for you. We will notify you when users have completed the course and provide certificates of completion – re-branding is not available for this option.If you have a high volume of potential users, or would prefer to manage the implementation yourself, we can provide you with a SCORM or Tin Can API file so you can upload the course on your own LMS system. We also offer face-to-face GDPR training for groups or one-to-one coaching for one or two people. We can create a bespoke course to suit your exact requirements, if you need to target one area specifically i.e. the responsibilities of a data protection officer, or we can create an agenda the covers all the core aspects of GDPR.